We (like most of you out there) are absolutely crazy for the graphic loveliness that vintage stamps add to any piece of mail. They just don’t make stamps like they used to, do they? If you’re thinking of using these beauties for your invites, remember that you’ll need a lot of them to add up to the 59 cents that most wedding invites cost to mail. If you’re using a calligrapher, perhaps consider telling her that you’ll need extra space along the top of your envelope to accommodate a whole row of stamps. And while you’re collecting them, remember to get as many high value stamps as possible. High value as in postage, not collectable-ness. Anything above 15 cents should be treated like gold. Seriously. Most vintage stamps are in the 3 - 8 cent range and if you do the math, you need A LOT of those little ones to add up to the correct postage. Moving on: Color and layout combos are infinite when you have a big fat stack of stamps in your lap. So, where do you get them? The $64,000 question, right? Finding them isn’t as hard as it might seem. Here’s our best tip… find a local stamp store (it seems like every major and minor city should have at least one, sometimes it’s a stamp and coin shop), and ask to see face value vintage stamps. There are plenty of stamps that are old and cute, but have no value to collectors. Those are the ones you want. If you can find a good store, your vintage postage will cost exactly the same as regular postage. Unless of course you can’t control yourself and buy 3 times as many stamps as you actually need. Not that such a thing has ever happened to us. If you can’t find a local shop, there’s always online options like Ebay, Champion Stamp, and as reader Kristy pointed out a few days ago, Kenmore Stamp Co.
Postage never expires, but you need to make sure you’re buying unused/uncanceled US stamps. If you do end up purchasing stamps online make sure you confirm that this is in fact what you’re buying. DIY-ish because it does seem a teeny bit unfair to call something DIY when the DIY-er is a designer by trade. But these were made at home, with the help of a Gocco, Paper Source, Ebay, and a few other widely accessible suppliers so they are technically possible for someone with a crafty set of hands. Kristina made these for a shower she’s hosting in her backyard next month. She and Melanie have a running joke that they both want to plan rustic barn weddings (BAD)… which is fine, until you realize that 1) Kristina is already married and 2) Melanie is having a black tie Monte Carlo inspired seaside affair in Del Mar this September. Then it starts to become a little weird… especially when you know how often they refer to said fantasy wedding. To (hopefully) give them some closure on this topic, Kristina is throwing a secret rustic barn wedding artfully disguised as Melanie’s bridal shower. Or something like that. Don’t worry, Melanie is totally on board. All paper came from Paper Source, envelope liners were cut from vintage wallpaper purchased on ebay, lacey notecards were made using a Martha Stewart craft punch from Michaels, and the stamps are from a local stamp store. We’re going to post more on the shower as it gets closer and of course we’ll show the party in action at the end of June. 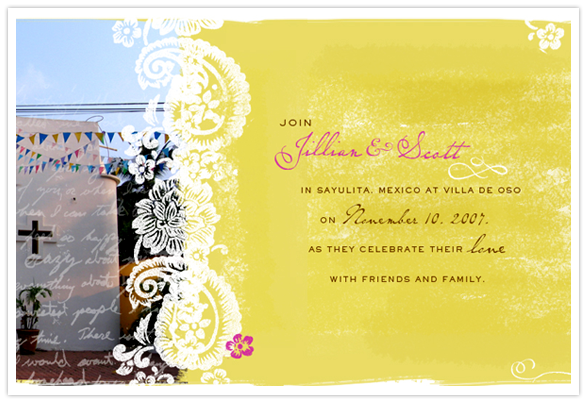 Our very own Jillian married her hubby Scott in the pretty, laid back beach town of Sayulita a year or so ago. Her wedding was beautiful and fun and full of cold Pacificos and warm sand… but most importantly (to us) it also included the pretty paper details that she designed herself. 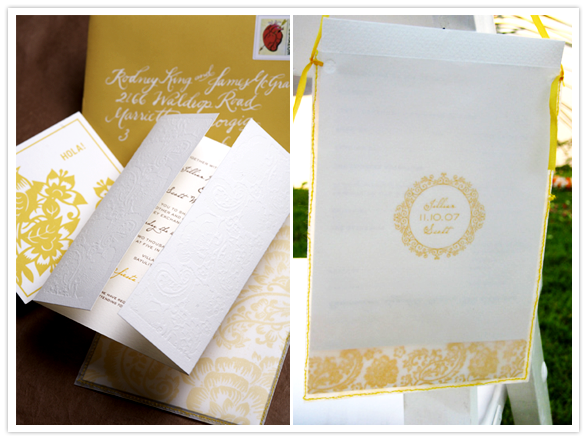 She wanted her invites to reflect the lightness of the actual wedding, (they asked their guests to wear white), while incorporating pops of bright colors that are so essential to Mexican culture. For inspiration, she and Amanda too a trip to Olvera Street in downtown LA, where they bought a bunch of bright paper flags. And she found a beautiful embossed card at Soolip, but buying enough for every invite would have been a little pricey… so she improvised. She contacted John Sullivan from Logos Graphics in SF create a plate (for $25!) using a pattern she found. She was also able to purchase the paper, cut/scored to the right size, from him. A close friend knew a little about letterpress, so they went to the San Francisco Center for the Book where they blind embossed the pattern onto her own gate folded card, in the style of the inspiration Jillian found at Soolip. 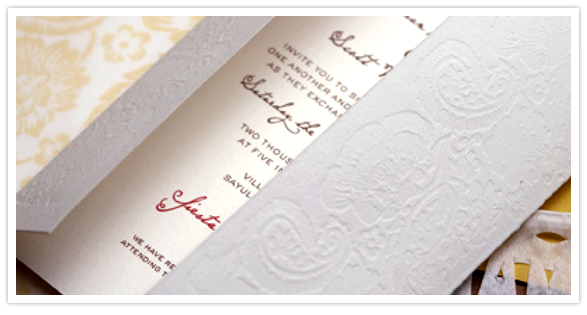 To save on printing, the main invite was printed at home on her Epson printer. Aside from the invite and pretty cover piece, her invitation suite included tons of little details to get her guests excited about their trip to Mexico. For her reply postcard, she used a perfect bird graphic she found from Beaumonde and had custom stamps made based on those super cute, semi-iconic vintage Mexican playing cards. 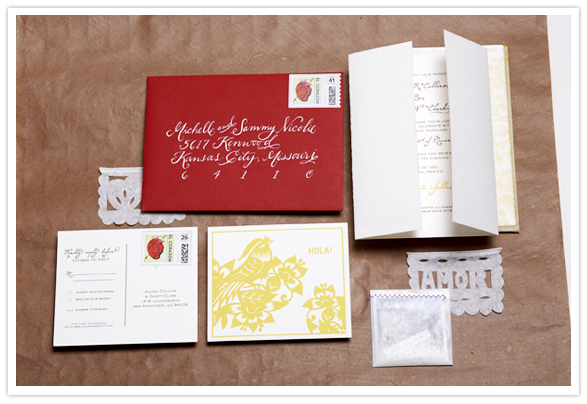 Her red and yellow envelopes came from Paper Source and she had Jenna (obviously) do the calligraphy. As an added bonus she created little velum packets that she stitched together herself, full of sand, photos Scott had taken of Sayulita, and a teensy Bienvenidos greeting. Then Amanda, being the good friend that she is, designed a website based on Jillian’s invites! Absolutely essential for a destination wedding, in our opinion. And how cute is this website?